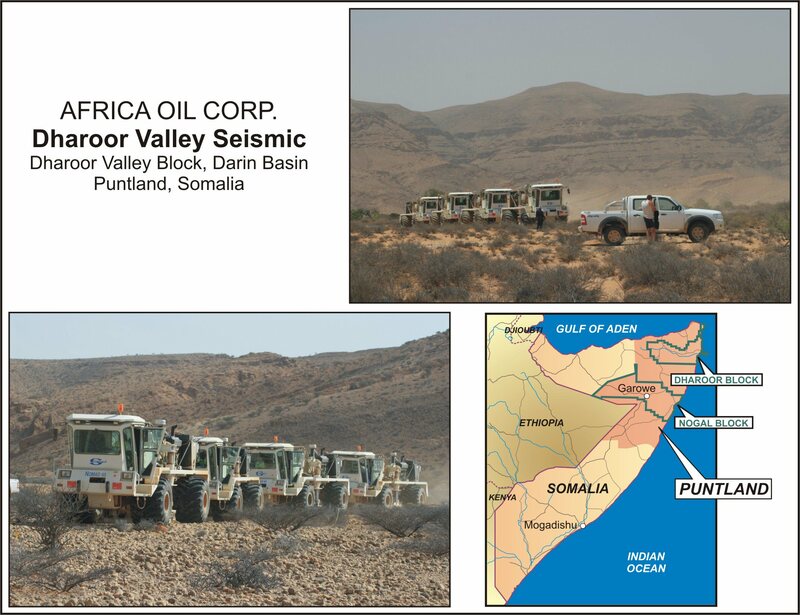 VANCOUVER, BRITISH COLUMBIA--(Marketwire - July 14, 2008) - Africa Oil Corp. ("Africa Oil" or "the Company") (TSX VENTURE:AOI) is pleased to announce that seismic recording in the Dharoor Valley of Puntland, Somalia commenced on July 9, 2008 (please see map and photos at the following link http://media3.marketwire.com/docs/714aoi_map.jpg). The Company plans to acquire approximately 2600 kilometres of 2D vibroseis data on the Dharoor Block before drilling 2 wells in each of its two Puntland concessions. In the Nogal Basin, Africa Oil has acquired all of the more than 4,000 kilometres of good quality 2D data which was recorded in the late 1980's. The Company holds an 80% interest in the Nogal and Dharoor blocks. The concessions encompass two highly prospective hydrocarbon basins and cover an area of 81,000 square kilometres or more than 20 million acres. The two sedimentary basins were contiguous with the prolific Marib and Masila basins in Yemen during the Jurassic and Cretaceous periods. Over 9 billion BOE have been discovered in Yemen but exploration has been limited to date in Somalia. Only 3 wells have been drilled in basinal settings in these concessions before operations ceased in the early 1990's. Those wells confirmed thick sedimentary sequences, encountered oil in Cretaceous sandstones and proved the presence of active petroleum systems in both basins. Rick Schmitt, President and CEO of Africa Oil, commented, "We are very pleased with the progress made in our concessions and appreciate the excellent support received from both the Puntland Government and the Transitional Federal Government. Commencement of the seismic program has also reduced the logistical demands on our Puntland infrastructure and we are now working hard to reinstate the drilling program in order to commence drilling during 2008."